Originally published in the Yellow Springs News on May 5, 2016. Trash is an inevitable part of life. A big part of life, to the tune of almost five pounds per person per day. According to Molly Yeager, senior corporate communications coordinator at the Rumpke landfill, that’s how much garbage the average American produces every day. Those five pounds of garbage have to go somewhere, and for Yellow Springs, that somewhere is the Rumpke landfill. Rumpke is a Cincinnati-based company contracted by Yellow Springs to collect and store its garbage. The Rumpke landfill is located in Colerain Township and serves most communities within 60 miles, said Yeager. It is the sixth-largest landfill in the United States. Rumpke’s land runs about 1,000 acres — about the size of the Glen — a third of which is specifically earmarked for the landfill. The compound also houses its 400 trucks, compost facilities and a gas refinery, which harvests the natural gas from decomposing garbage. Vickie Hennessy of Zero Waste Yellow Springs recently organized a tour of the Rumpke landfill, in an attempt to encourage villagers to reduce waste. Around nine Yellow Springs residents took the tour in order to see what five pounds of garbage per person per day actually looks like. Following the landfill tour was a trip to Rumpke’s recycling facility, as the company also handles Yellow Springs’ recycling, where people on the tour expressed surprise at the facility’s efficiency but seemed shocked to learn they were going about recycling all wrong. The tour group left Yellow Springs and carpooled to the landfill. The tour groups met in the landfill’s parking lot, near the weigh station where hundreds of trucks are weighed before they dump their loads. The garbage collected in Yellow Springs is first sent to a transit station in Dayton, where it is then hauled by semi to the landfill. The tour was lead by Yeager, who narrated the workings of the landfill from a small tour bus. The trucks dump an average of 6,000 tons of garbage per day, she said, less than the 10,000 daily tons allowed by the EPA, which includes both municipal solid waste (MSW) and construction demolition debris (CDD). The amount increases significantly around the holidays, Yeager said, or after a natural disaster. The trucks follow a path to the day’s dumping area, where the trash is pushed around and crushed by bulldozers with spiked metal tires. An enormous 13-acre, 200-foot deep crater is currently being developed as the next section of the landfill, set to begin taking garbage in July or August, said Yeager. Three feet of impermeable clay lines the bottom of the hole, which is followed by a plastic liner and then a “geotextile cushion liner.” A pump system runs throughout the latter layer to drain leachate, or garbage juice. Garbage is then dumped onto this layer. When the hole is filled to capacity, layers of plastic are laid on top to seal it, sometimes including an odor control blanket, which uses odor-eating technology found in tennis shoes and trash bags, Yeager said, pointing out a five-acre expanse covered with such a blanket. The company found that this particular pile was decomposing at a faster rate and at a higher temperature, she said. The company wasn’t quite sure why, but the smell it was emitting was proportionally stronger than normal. The odor control layer is part of Rumpke’s efforts to make the dump “invisible at the property line.” Other methods include a line of misters spraying a vegetable-based deodorizer into the air. The layer of trash and covering is then covered with soil and grass. A prominent feature of the landfill is a grass-covered garbage hill (popularly known as “Mount Rumpke”), rising to 1,064 feet above sea level, 10 feet shy of the EPA’s 1,074-foot height limit. A flagpole with billowing American flag sits atop this mountain, which doubles as a Christmas tree during the holidays. Citybeat.com says it is the highest point in Hamilton County. “And overall, more than half of what is in the dump could be reused,” Yeager said. Plastic shopping bags are visible in the piles of garbage and hang here and there from trees. Rumpke employs people specifically to capture blowing plastic bags, and they have fences around the perimeter of the dumpsites to try to catch them as well. Eric Johnson of Yellow Springs was on the tour, filming the visit with the intention of putting together an educational video. He was taken aback by the fact that four percent of the dump is diapers, he said, and he had no idea that managing the amount of loose bags in the dump required its own staff. Yellow Springs resident and tour member Harvey Paige was likewise taken with the profusion of billowing bags, and said Yellow Springs might want to revisit the notion of banning them. “You have to see it to comprehend it,” Paige said. According to Rumpke’s estimates, the space they currently have available to take garbage will be full in 11 years. The company is currently suing Colerain Township, Yeager said, in order to expand its operations. However, Yeager said, there is an upside to the amount of garbage. As the mountains decompose from the inside, the decomposing garbage releases carbon dioxide and methane gas (along with traces of other gases), which the company is able to harness as an energy source. There are around 200 gas wells on the property, and a garbage-gas refinery, the largest of its kind in the world, she said. Some of Rumpke’s trucks are powered with this natural gas, and the company contracts with Montauk Energy to use this gas to power approximately 25,000 homes. When sections of the landfill are filled, sealed and covered, they have the potential to be vast green spaces, Yeager said. A number of public places are actually built on landfill land, she said, such as Comiskey Park in Chicago and a golf course in West Jefferson. Moreover, potential for groundwater contamination is not high at the Colerain site because there is no water for 1,000 feet underground, she said, and then it is salt water. Nevertheless, covered landfills require monitoring for the next 30 years, she said. Less garbage is always the best option. The small bus shuttling the tour group around the landfill wound its way back to the parking lot. The group left and drove 10 miles to the Rumpke recycling facility in Cincinnati. 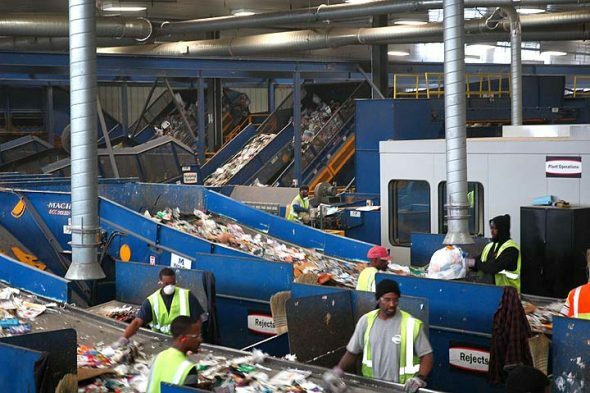 Rumpke offers single-stream recycling, in which all recyclable items can be put into the same bin and are later sorted at the MRC (“merc”), or Material Recovery Facility. Anne Grey, an education specialist at Rumpke, led the tour of the facility. Visitors are required to wear helmets and eye protection. The tour was narrated via headset, owing to the enormous din of three floors of machines. The area’s recycling is brought to the recycling center and dumped in an enormous intake pile. The tour group stood behind windows overlooking the pile, which is loaded onto a series of conveyor belts and machines. The belts zoom past employees who remove items that are obviously not recyclable, such as piping and video game controllers. The items are further separated by humans and machines as the belts move along, until they are finally separated by type. The process is automated and very fast. A rare earth magnet at the end of one belt system separates cans from non-metals by using magnetic opposition to launch cans into a specific bin; an optical scanner reads the wavelength of incoming plastic jugs, which are then individually hit with a burst of compressed air and launched to their own bin. The facility processes 55 tons of recyclables per hour, Grey said, or 350,000 tons per year. The recycling center is always busy, but the amount of material it processes doesn’t mean everything gets recycled. Grey said a lot of people practice what she calls “wish recycling,” in which they throw everything they think can be recycled into the bins. While one common conception is that if it’s plastic, it’s recyclable, that’s not the case, she said. Plastics in the shape of bottles and jugs are the only kinds of plastic the facility accepts. Number 5 plastics, such as yogurt containers, contain an additive that makes them melt at a different temperature, Grey said, and none of Rumpke’s clients have a use for those sorts of plastics. This means that the clamshell cases containing fruit and vegetables, any kind of plastic packaging and hangers are not recyclable, nor are plastic bags, though Whole Foods has a recycling program that accepts clamshells. Tour participant Johnson said the most surprising aspect of the tour was his corrected misconception about what can and cannot be recycled. However, Johnson was pleased to find out that some of his misconceptions were corrected in the direction of more recycling, not less. According to Grey, many people think that lids and caps cannot be recycled, but this isn’t true. Plastic lids can be recycled and even left on the bottle, as can metal lids if they are removed from their glass containers. Ultimately, items sent to the MRC will be processed and either sorted appropriately or disposed of in the dump. However, tossing items willy-nilly into bins not only makes for more work for the employees but can also be dangerous. The facility does not take scrap metal, for example, but large pieces of jagged metal frequently come down the conveyor belts, as do splintered bits of wood. Even a piece of a motor once appeared, which got caught in one of the machines and had to be pried out. Whether or not a bottle is rinsed out doesn’t affect its recyclability, but a cursory rinse is a nice thing to do for the employees of the facility, Grey said, as that reduces the likelihood they’ll be spattered with the stagnant contents. Although the company didn’t mention the landslide that exposed 15 acres of garbage in 1996, Hennessy said, or the fact that the exposed area was struck by lighting and burned for almost a week, she was impressed with how upfront the company appears to be about the potential dangers of the landfill and what it is doing to address them. The efficiency of the operation was evident, she said, a far cry from the municipal dumps of yore in which people would just throw things in an open pit. Nevertheless, five pounds of garbage per person per day is a sobering, motivating sight.